More than 125 students and 36 teachers from 24 schools across Western Australia took part in the third annual Catholic School Youth Summit at the University of Notre Dame Australia Fremantle campus. Source: Perth Archdiocese. 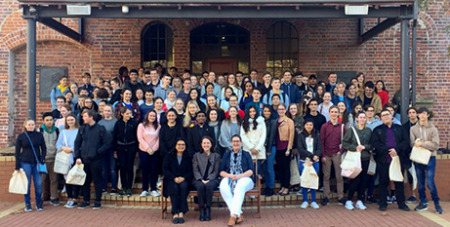 With 2018 being the Church in Australia’s Year of Youth, this year’s summit was particularly significant in encouraging youth to share in the life and mission of the Church, learning more about leadership, the importance of listening to one another, and sharing ideas about how to how to live out these intentions in their own lives as future leaders. Inspired by the Year of Youth and the Plenary Council 2020, the theme for the summit, “Your voice is needed – join in!”. The event included a number of guest speakers. Students at the summit took part in the Plenary Council’s Listening and Dialogue process, one of the youngest groups to do so. Plenary Council facilitator Lana Turvey-Collins told the students that their voices were definitely needed during the Plenary Council process. She encouraged the young people to see themselves as the “now” of the Church, not just its future. Shark attack survivor Sean Pollard addressed the summit on the topic of resilience with the resounding message being “don’t give up – keep trying”. The final keynote for the day was Channel Seven news presenter, Rick Ardon, who covered a range of topics with students, from the pitfalls of social media and the importance of not chasing happiness through material things, to bullying, giving back to others and “seizing every opportunity”. Students also took part in sessions that allowed them to further discuss and explore topics such as prayer, making a difference and drawing near to God.